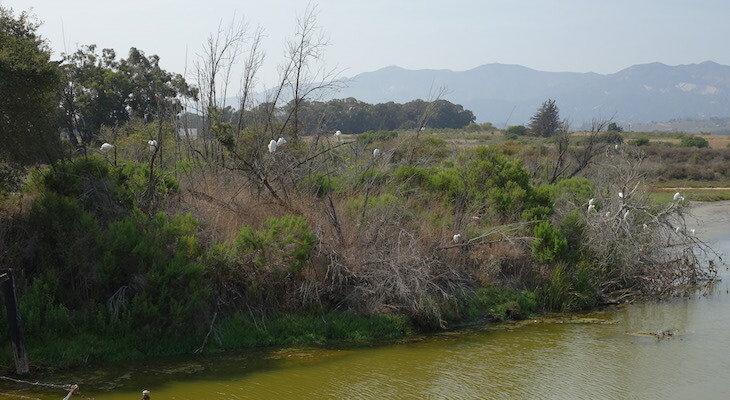 Snowy Egrets seem to be holding a convention at Devereux Slough at Coil Oil Point past Isla Vista! Here are some of my recent photos there! I did not grow up around such magnificent birds. To see just one is an endless treat for me. creating art. Parking is very limited for that purpose. I practice my music at the bluffs near Isla Vista. So it is a regular joy for me to pass this area. Thank you for identifying some of the bird species DESTAG. Actually, that entire area is part of UCSB's Coal Oil Point Reserve (COPR). ========================================================================== Here is a map of the Reserve showing how Devereux Slough is part of COPR http://copr.nrs.ucsb.edu/sites/copr.nrs.ucsb.edu/files/maps/topo.jpg ========================================================================== It is perfectly legal to drive to the spot in my photo marked by the informational kiosk. You can park there and view the birds. You are even allowed to stay and make paintings of the birds and scenery there. You just need to stay near your vehicle. ========================================================================== I have never actually driven there because I always ride my bicycle there. Enjoy! It is not. Look at any map. This is like saying anywhere around UCSB is Campus Point...get it. This would confuse anyone if they thought they needed to get to Coal Oil Point to see the birds and tried to park here. If they want to go there they would have to park in IV and walk along the bluffs. Nothing nit picky about it. Just correcting a post that could get some birder from else where towed. The whole area is called Coal Oil Point. Why do you have to spoil your otherwise helpful comment by nit-picking in a way that is not even correct? Yes I'm aware it's part of the Reserve, as I go there all the time, but Coal Oil Point is over a quarter of a mile from where these photos are taken and you can not drive to the point as you said below. As I said if you park here by the kiosk or the other ( first ) viewing spot a quarter of a mile back north on Slough Rd. you must stay near your vehicle. Actually all the photos are by the water sampling platform and none at Coal Oil Point. The birds in the 6 th photo are Great Egrets and the 11 th shot fly-by is a Double-crested Cormorant. The Egrets are here all seasons except summer, these being fall arrivals. It should be noted that unless you have a permit you can not leave your car here and walk to Coal Oil Point. One must be near their vehicle or they will be cited by Campus Police. Thank you TWO ABBYS and FLICKA for the kind words. The gathering was still happening as of yesterday so you can still check it out yourselves! UCSB generally restricts motor vehicle access to Coal Oil Point. But they do make an exception for bird watching. The gathering spot is out near the end of the road near the gate. You are so lucky to have seen all those beautiful Egrets. Thanks for sharing.